The elusive Charles Waterhouse “Chip” Goodyear IV reappears, but very quietly. We had read on the Internet that he was living in London, and we had heard that he turned down a job with a European company. Then those articles seem to have disappeared – at least we could no longer find them. Thanks to one of our readers, however, we received some information about Goodyear – information that, on the surface, seemed quite trivial. That is, until we dug a little deeper, based on information given to us by our informer (his comment is listed on this site). Well, we checked. 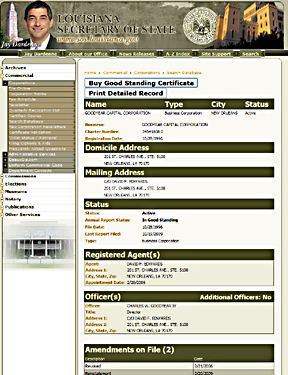 The Louisiana Secretary of State site showed that the registered office of Goodyear Capital Corporation is at 201 St. Charles Ave., Ste. 5100, New Orleans, LA 70170. This address is in a fancy office building in downtown New Orleans. 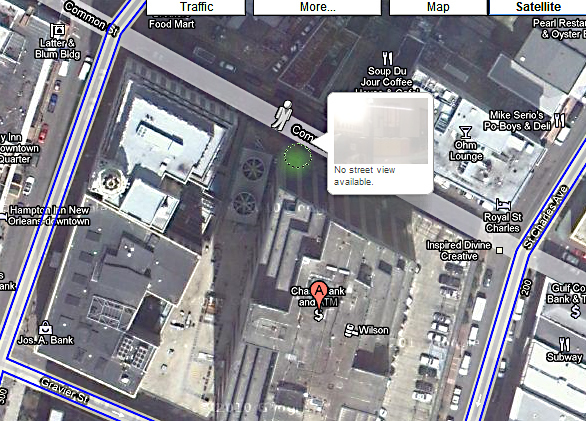 We checked, and found that the former address of Goodyear Capital Corporation, 985 Walker St, New Orleans had been removed from Google’s street view. How often does something like that happen? Going one step further, we checked Google street view for Goodyear’s new location on Charles Street. Charles Street does show on Google street view, but the little Google street-icon guy turned from yellow to gray, when we dragged him to Common Street, the side street to Goodyear’s registered office. The surrounding streets were lined with purple, indicating that Google street view was available on those streets. However, no purple on Common Street. Again, how often does something like that happen? A side entrance for CIA employees? And why was the run down street of Goodyear’s former office removed from Google street view?